In case you are interested, I visited the development office of the new condo project as a pretend buyer. The plans are still preliminary, but they have poured the foundations of two of the eight buildings they plan on building. There will be 53 units, with a price per square foot of $1k to $1.5k per sqft², and the units will range from 3000 to 5000 sqft². Expected range of prices per unit is $3 to $6 million, with ~130 parking spaces plus guest spots. Each unit will have a two or three car garage, typically detached. The driveway off Tramanto will split into two roads, upper and lower to service the respective buildings. Expected move-in date for first two buildings summer of 2018. There will be no significant common area amenities, meaning no pool, gym, or common room. Most units will have separate elevator access to their own unit. The area directly behind the Bay Club gym is a separate box-like apt building from a different developer. The pricing seems out of line with any possible comparison, but the plans are still in flux. Purchases are currently non-binding, with $50,000 refundable down payment. The apartments on this site where Landmark plans to build 54 townhouses have been demolished down to the garage floors and driveway. Recently, the area has been fenced and we have heard that a grading plan is being developed so the earth movement may start next spring. The developer received a one-year extension from the City to his building permit and is currently working on plans for the projected townhouses. 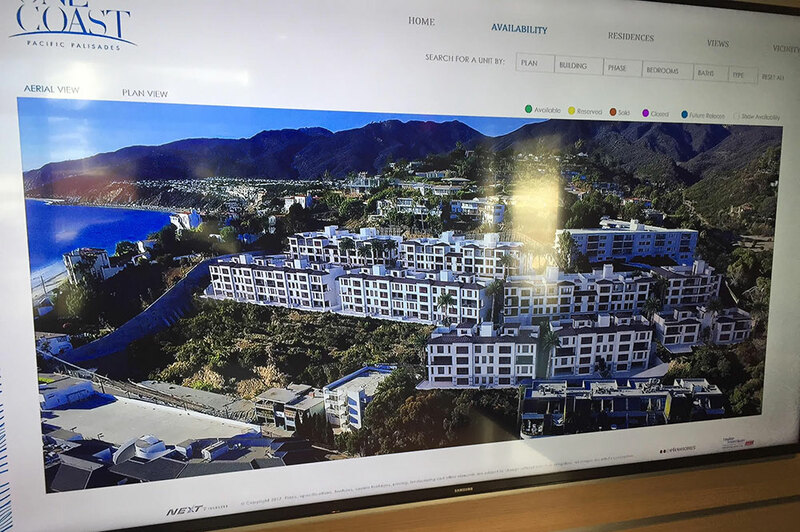 In addition, a neighbor reports that Landmark has requested an amendment to their California Coastal Permit for permission for a reduction in the number of condos from 61 to 54 and a reduction in total size of 1578 square feet with a slight change in building footprints. The Landmark Condo Project has been reduced from the original 82 to 61 units keeping the same square footage. The Coastal Commission has approved the project and construction is scheduled to begin in 2007. The developer has agreed to include potentially affected homeowners in his insurance policy. There was a Public Hearing on the City Planning Commission approved 82 unit Landmark Project at 17331 and 17333 Tramonto Drive on Thursday, November 4, 2004 in Room 1010, City Hall, 200 North Spring Street at 8.30 am. The City Planning Commission approval which was issued on September 21, 2004 was appealed in writing by the prescribed deadline by CMHO, the developer, Ken Kahan (Palisades Landmark, LLC), PPRA and a group of individual homeowners who live on Revello Drive. The developer was appealing to be permitted to build offsite the low cost housing component of the 82 units mandated by the Mello Act. It was anticipated that only the five appellants would be allowed to speak. However, we urged you to attend this public hearing to show your support for the CMHO position that only 50 units should be built. BE SURE TO CHECK OUT ALL THE LATEST NEWS!